After (the) Burn – HPBExpo and AeroDef 2013 Shows in the Bag! | Frank. After (the) Burn – HPBExpo and AeroDef 2013 Shows in the Bag! March saw the launches and conclusions for the 2013 HPBExpo and 2013 AeroDef Manufacturing tradeshows. Two vastly different shows for two vastly different audiences, and on two coasts, with one common factor…. us. That’s right, Frank developed the overarching creative concept (including all of the necessary accompanying marketing tactics) for each of these two fantastic shows. ● The Hearth, Patio & Barbecue Expo (HPBExpo) is North America’s largest indoor-outdoor living showcase. Every year, more than 350 leading hearth, patio and barbecue manufacturers and suppliers exhibit and demonstrate their latest home heating solutions; grills, grilling accessories and fully-equipped outdoor kitchens; casual patio furniture and outdoor accents; water and landscape features; all-weather entertainment products and more. The show attracts more than 5,000 specialty and mass market retailers, and professionals interested in getting a first look at the indoor-outdoor living innovations that consumers will be asking for in the seasons ahead. ● AeroDef® Manufacturing is the leading exposition and technical conference for the aerospace and defense manufacturing industry. Produced by the Society of Manufacturing Engineers (SME), in partnership with industry OEMs, the event showcases the industry’s most advanced technologies across an innovative floor plan designed to facilitate interaction and business relationships between exhibitors and buyers looking for integrated solutions. Our keynote speakers and panelists come from the highest level of government and business. They come to share their vision of the potential of technology, collaboration and public policy to transform manufacturing – concepts that attendees can actually experience on the exposition floor and in our in-depth conference sessions. It’s the one event that brings together high-concept, integrated solutions and real-world applications. And here’s the kicker, two of the projects we developed for these shows (one from each) are finalists for this year’s Baltimore’s American Advertising Federation Awards (Addys)! 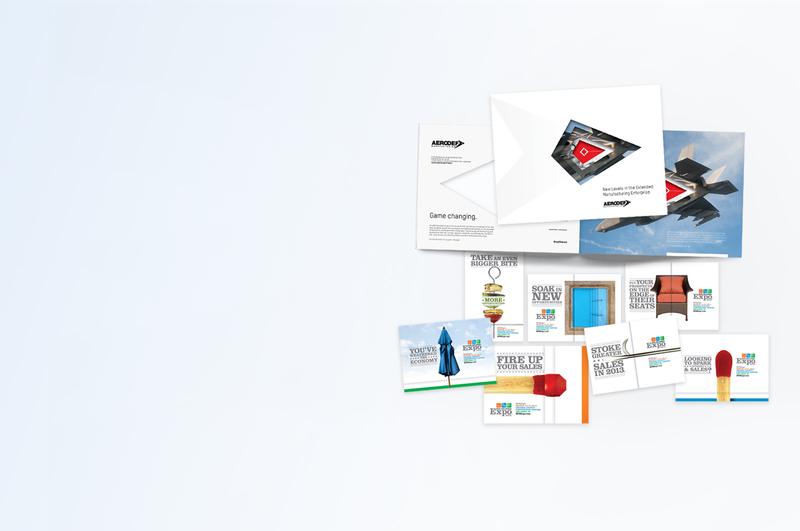 First up, we have a series of micro-targeted DMs for the HPBExpo which were developed with specific messaging for each audience segment of the show – Hearth, Patio, BBQ, Spa, and General. Utilizing exaggerated, bold product imagery, specific to the varied market segment, and interesting fold configurations that revealed the message, the DMs hit the prospective attendees with key statistics about what they could expect to see from the show, a clever, eye-catching headline, and highlights about the conventions center. Our second finalist, the one associated with the AeroDef conference, is the AeroDef Manufacturing prospectus – the flagship piece which established the entire creative focus for the 2013 show. It previously won a Q award from the Printing & Graphic Association Mid-Atlantic (PGAMA) for it’s progressive die-cutting technique. The prospectus offered a bold, new direction for AeroDef show branding, doing a complete 180 from the darker, sci-fi imagery from the previous show’s brand to a cleaner, white creative composition. Come cheer us on at the 2013 Addy awards this Thursday, April 4th! As always, tickets can be purchased here.